With an experience of over two decades in the field of Intellectual Property Law across South Asia, Gulf, Middle East and North African countries. He is one of the senior most members of the firm. Over the years, he has participated in innumerable International IP conferences around the world and has served on various important committees of IP Law Associations. He is a longstanding member of many international associations of IP practitioners including INTA, ECTA, ITMA, CIPA, AIPPI, FICPI, APAA, LES. 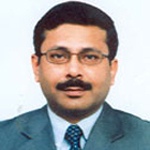 He has served as the President of APAA Pakistan Group from 1998 to 2006. He is one of the four Delegates for the Independent Members of AIPPI representing Asia on the Council of Presidents and the Executive Committee of AIPPI.